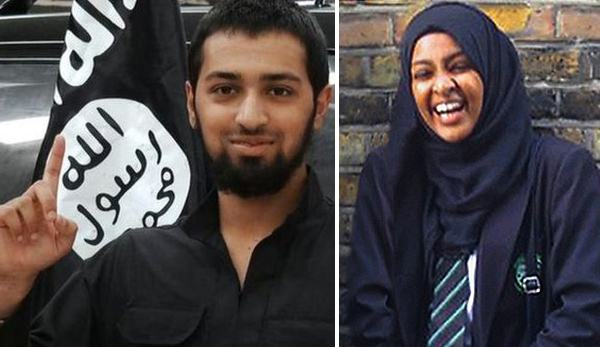 On photo: Talha Asmal (left), a 17-year-old from Dewsbury, is believed to have become Britain's youngest suicide bomber when he blew himself up at an Iraqi oil refinery. Friends described Asmal as an "ordinary Yorkshire lad." Amira Abase (right) travelled from London to Syria in February, at the age of 15, to join the Islamic State as a "jihadi bride." According to The Telegraph, a close associate of Meziane, Djamel Beghal, mentored at least two of the suspected gunmen responsible for the killings — Amedy Coulibaly and Cherif Kouachi — while they were together in prison. Beghal's wife, a French citizen, is living in the UK, courtesy of British taxpayers. Sylvie Beghal lives rent-free in a four-bedroom house in Leicester. She came to Britain with her children in search of a more "Islamic environment," after deciding that France was too anti-Muslim. "Mohammed was selling me for ?250 to paedophiles from all over the country. They came in, sat down and started touching me. If I recoiled, Mohammed would feed me more crack so I could close my eyes and drift away. I was a husk, dead on the inside. April 25. The Telegraph reported that British taxpayers are paying the monthly rent for Hani al-Sibai, the Islamist preacher who "mentored" Mohammed Emwazi (aka Jihadi John, the ISIS executioner). Al-Sibai, 54, a father of five, lives in a ?1 million home in Hammer-smith, a district in West London. June 1. Karim Kazane, a 23-year-old Muslim man, demanded that Zizzi, an Italian restaurant chain, pay him ?5,000 (€7,000; $7,800) in compensation after he found a piece of pepperoni in a meal at their branch in Winchester. Kazane was halfway through a carne picante, advertised as containing beef and chicken, when he discovered the meat banned under Islam. Also in September, a London art exhibition celebrating freedom of expression banned anti-ISIS artwork after police raise security concerns. "ISIS Threaten Sylvania," a series of seven satirical tableaux featuring the children's toys Sylvanian Families, was removed from the Passion for Freedom exhibition after police raised concerns about the "potentially inflammatory content" of the work. The police informed the organizers that, if they went ahead with their plans to display it, they would have to pay ?36,000 ($53,000) for security for the six-day show. October 9. Channel 4 News reported that Muslim convert Jamal al-Harith, who was awarded a ?1 million ($1.5 million) payout by the British government after being released from the Guantanamo Bay detention camp in Cuba, has fled to Syria and joined ISIS.